For many of us, there’s no joy in this world comparable to a hot cup of fabulous tea. And for people like us, Goa-based company, the Tea Trunk is bringing cup full of immense happiness in different blends and flavours. Brainchild of Snigdha Manchanda, Tea Trunk sources its high quality leaves from estates all over India. Then they infuse the leaves with natural ingredients to create that perfect blend. 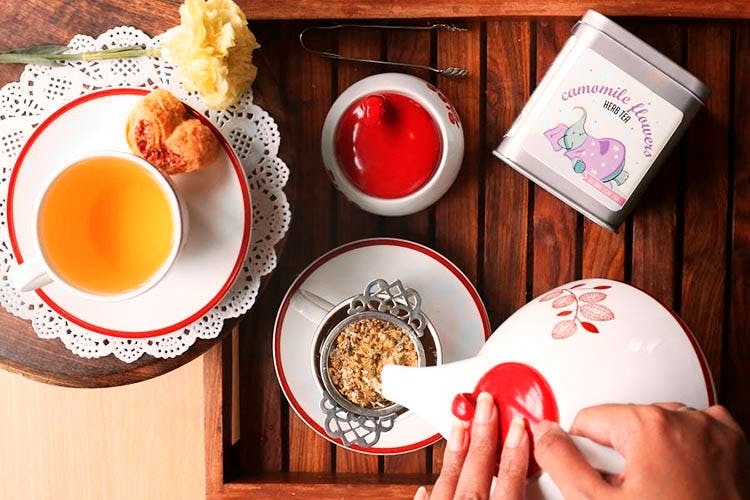 Packed in adorable tin boxes featuring a cute elephant, these wonderful tea mixes will not disappoint you with dusty-grainy leftovers. Contrary, Tea Trunk supplies leaves that are whole and fresh. We loved their marigold green tea, an enchanting brew combining the flavours of lemongrass, marigold and organic green team. Priced at INR 500 for 15 tea bags, this blend is known to improve digestion and compliment your detox regime. The rose oolong tea for INR 800 is a clever creation brewed with semi-fermented oolong tea leaves along with rose buds and petals, with a hint of floral and mellow after-taste. If you want to curb your caffeine consumption, we highly recommend you try the moon white tea for INR 1,350. This decadent blend combines the goodness of tea leaves plucked from the glorious estates of Darjeeling and has 12 times more antioxidants than a glass of orange juice. Must-try the apple spice black tea, a blend inspired by mulled wine and made of whole leaf Assam black tea, cinnamon, star anise and clove, scented with the fruity flavours of apple, orange and cherry. Order your very own Tea Trunk and enjoy a cup of flavourful tea! Tea Lovers! Stock Up On These Delish Tea Packs For INR 599 Only!